The Gua­da­lu­pe River is the park's most out­stand­ing natural fea­ture. Imposing bald cypress trees line the banks. On its winding path through the park, the river courses over four natural rapids. Two steep limestone bluffs reflect the river’s erosive power. Trees in lower elevations and bottomlands include sycamore, elm, basswood, pecan, walnut, persimmon, willow and hackberry. 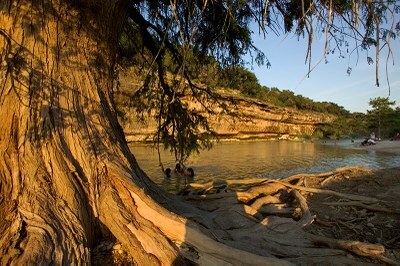 In the uplands away from the river, the limestone terrain is typical of the Edwards Plateau. Oak and juniper woodlands fill this area, with some grasslands mixed in. An area of virgin Ashe juniper woodlands provides nesting habitat for the endangered golden-cheeked warbler. In addition to numerous species of birds, the park supports a wide variety of wild animals. These include white-tailed deer, coyote, gray fox, skunk, raccoon, opossum, bobcat and armadillo. Other smaller species live here, as well. Download Birds of Guadalupe River State Park and Honey Creek State Natural Area (PDF).